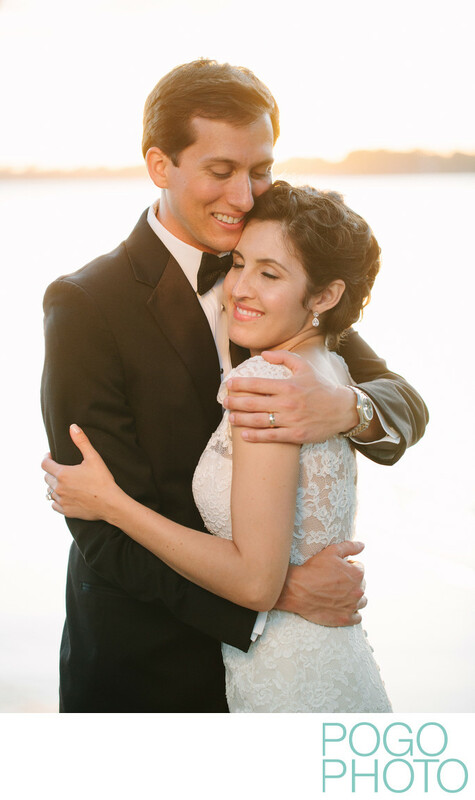 This image of a happy and glowing couple just after their wedding ceremony was taken on a glorious, sunny day with just the right amount of brilliant, golden sunlight in Burlington, Vermont. Burlington, VT is the largest city in the state and also has the most options for wedding venues both in the city and throughout the surrounding Champlain Valley. Burlington is the starting point for a large percentage of couples getting married in Vermont, either as an access point through the airport, a place with all of the amenities a city provides, a location full of hotel options for visitors, or as the potential site of the wedding itself. Walking down Church Street in the downtown area is a great way to unwind and take in the sights, sounds, and flavors of the area. There are a few chain stores and cafes, but most of the eateries lining the cobblestone street are locally owned and unique to Burlington. About three blocks to the west down Pearl Street is Hotel Vermont, home to our favorite restaurant in the city, Hen of the Wood. We highly recommend popping in, even if only for a quick snack or a crafted cocktail at the bar. Luckily this is not the only restaurant they own, as the original Hen of the Wood is still open in Waterbury, VT 30 miles to the southeast. Burlington serves as the center of the metropolitan area, encompassing suburbs like Essex, Winooski, Williston, and even Shelburne to the south. The views from the Burlington area are spectacular, and sunny days like the one this couple was able to enjoy on during their wedding only enhance the already stunning vistas. Standing at the top of the hill in Burlington you can the city slope downward into Lake Champlain, leading your eye across the water into upstate New York where the Adirondack Mountains appear in layers extending straight to back to the horizon. While the view of New York is great from Burlington, capturing the essence of the Green Mountain State is often more important to the people who get married within its borders. The way this photo was shot highlights the landscape and topography of the ceremony location itself more than it features what can be seen in the distance from there. This is important to us as photographers, as we need to keep in mind why the couple selected a certain place and blend those thoughts with our artistic vision. This overlap between what we see and what we know the couple values extends to groupings of people, wedding day details, and the architecture of the venues they select. Much like nearly everyone, we like sunny days and we’re pretty sure sunny days like us back. We spend the winter in Jupiter, Florida on the east coast of the Sunshine State, then spend the summer in Vermont, the clearest season of the year there. To look at it another way, we skip gray clouds, dark days, and snow shoveling up north and we pass on most of the stormy hurricane season down south. We can shoot in any weather condition, but we do so much to set ourselves up to see beautiful natural light it is like taking a road trip and saying “hey, let’s disengage the parking brake this time.” Our actions show Mother Nature that we appreciate when the sun shines for us, and we jokingly thank her because she seems to send sunny weather with us whenever we travel. Three days in Portland, Oregon and we never saw a cloud. It poured the day before we arrived in Seattle and it was overcast the day after we left, but we saw nothing but blue sky during our last vacation there. (It did make the mind blowing doughnuts from the Dahlia Bakery downtown taste even better, or at least it made the berry jelly glow red!) Taking this theory to an extreme, we took an epic 33 day road trip from Florida to Alaska in 2015 and it rained for two hours in Atlanta and misted for eight hours in Fairbanks, AK. That means it rained on us roughly 1% of the time we were gone, amazing us and sometimes agitating fellow travelers. When stopped at an overlook to see Denali for the first time, a backpacker commented that he had been hiking for thirteen days and this very moment was the first time he was even able to make out the peak at all, let alone see it against a perfectly blue sky. At that point we had been there for about two minutes. The sunny day experienced during this wedding could have been considered partly cloudy when this photo was taken, but the clouds only affected areas nearby and allowed us to use them to our advantage. Here the couple is standing near the edge of the shadows cast by a group of trees. Using shadows from nearby buildings and tree cover allows us to manipulate the light in a more constant way than chasing the shadows cast by moving clouds. The consistency of how the light is falling nearby allows us to be properly situated to capture our subject against a more dramatic background. Roaming clouds can block out the sun in a variety of different ways, but partly cloudy days in the mountains of Vermont let the light dance across the peaks and valleys, highlighting different parts of the land as it moves. We love being able to capture large swaths of light in the distance, providing depth in our images. Here the brilliant light reflecting off the lake behind the couple creates a pleasing glow on their faces as it bounces off the sidewalk beneath their feet. We have learned to seek out light of this nature and use it in a way that makes a photo more dramatic without looking like it was manipulated in a computer. In fact, this image is almost exactly how it came out the camera. We strive to document a wedding day as it occurs and try not to get overly dramatic with completely unnatural lighting or posing and this image exemplifies what we try to achieve. 1/320; f/2.8; ISO 640; 100.0 mm.